HebCelt Shortlist For Hall Of Fame.Vote. The Hebridean Celtic Festival which is celebrating its 15th anniversary created its Hall of Fame to mark the anniversary and the first three inductees were renowned Scottish artistes Runrig, Julie Fowlis, and Peatbog Faeries has now opened voting for the next round to festival-goers. There are three categories now open to the public vote. One artist or performance will be recognised from each category. Author dmorrisonPosted on April 27, 2010 Categories News, Taransay News, Tutor NewsTags 2009, Alistair WhiteLeave a comment on HebCelt Shortlist For Hall Of Fame.Vote. I don’t know if you can help, but with all your fiddling contacts, maybe you can help. We need a male fiddler, age 25 upwards, to not only play/perform/compose but also to act in our forthcoming production of “Roghainn nan Daoine”. Gaelic preferred, but not necessary as the playing ability is paramount. I know it’s short notice, but the period we require is 3-26 May, rehearsal period in Stornoway, and 27 May to 19 June, touring period throughout Scotland. This is a paid position at £***. ** per week (just above Equity minimum rates). If you can think of anyone who may be interesteed and fits the bill, please pass this on! Many thanks for your help with this. Acras gun talamh-àitich, dùsgadh na h-Eaglaise Saoire. (Hunger without land, the Free Church emerges). Touring May/June 2010 throughout Scotland. Hebridean musicians entertain in the Balkans. 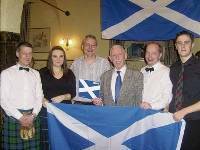 Our photo shows (left to right) Dolan and Catriona, along with British Ambassador to Slovenia, Tim Simmons and the Irish Ambassador to Slovenia, Croatia, and Bosnia, Patrick McCabe, and the two other members of the band, Iain Macleod and Iain Macinnes. FOUR Hebridean musicians have just returned from the Balkans where they entertained at many functions during their week-long visit. The musicians were Catriona Watt of Stornoway (fiddle and whistle), who recently won BBC Scotland Young Traditional Musician of the Year; Dolan Morrison, well know Stornoway fiddler and joint organiser of the world famous Taransay Fiddle Camp; Iain Macinnes of Coll, Back (accordion, guitar and piano) who is a fourth-year student at Aberdeen University; and well-known Uist piper Iain Macleod of Lochmaddy (pipes and whistle). As well as performing at various functions in the Balkans, the party also entertained the handicapped children in the Christine Willcutt centre in Sarajevo, Bosnia-Hercegovina. “We arrive on the Saturday at Ljubljana airport in Slovenia after a two-hour flight from Stanstead Airport. Ljubljana has a beautiful blend of architectural styles with clean, wide streets. We are treated to the local fare which is all home grown and extremely tasty. We head to the mountains where there is a shortage of snow this year and play some ceilidh music for the locals. The scenery is just spectacular and we dine on local Strudle and hot wine to keep warm. Iain Macleod plays his bagpipes and the tourists flock around him. On Monday, we visit the Postojnska jama caves, the most visited caves in Europe. This is a two-hour journey underground on a train and we admire the size and splendour of the different rooms underground. In the largest cave, Catriona sang a Gaelic song to an international audience where the sound was reverberating around the cave. On then to Predjama Castle, perched halfway up a 123-metre cliff. This castle is 700 years old and was the home of the rebellious knight, Erazem Predjamski. We travel to the Adriatic coast to a town Piran on the Italian border. Piran is a historic-walled town on the Istrian coast of Slovenia. We dine on the most tasty sea bass and various other succulent fish. The group then play music to the locals before heading back to Ljubjiana. A long day…..
We have breakfast from our hosts, starting with Rakija, a traditional spirit in Croatia. It can be distilled from plums or pears, among other fruits. Slivovica, distilled from plums, is the most popular and is valued even outside Croatia. It is a strong spirit with 40% abv or higher. Rakija is the only spirit produced at home in hand-made distilleries. It certainly wakes you up! This is followed by local porridge, Kasa which is very tasty. In the evening, we play our first official event for the British Embassy. Eighty guests from the Embassy and also international Embassies attend and the event is a huge success. A gift is presented to the British Ambassador, Tim Simmons on behalf of Comhairle nan Eilean Siar. We also meet and have a wonderful conversation with the Irish Ambassador, Patrick McCabe. We leave Slovenia and head for Split in Croatia.This is a 450km drive and it begins to rain heavily, but thankfully there is a new toll highway built by the Americans from Zagreb to Split, and the roads are very quiet. The scenery is just incredible and there are many tunnels through the mountains. We arrive in Split which is a busy port with an international airport and regular ferry services with the nearby islands, the north and south Adriatic, Italy and Greece. We pass the Hajduk Split football stadium which is very unusual in appearance. We appear and perform on Croatian television in our kilts which we enjoy. Then it’s on to perform at the Luxor hotel to entertain the Ambassador and crew of a visiting Royal Navy frigate. We depart Split and start the long eight-hour journey to Sarajevo, our ultimate destination. We head south down the Croatian coastline and witness the numerous islands off the Croatian coast. We stop for some local food which is the local lamb cooked on a spit. This is really tasty. On crossing the border in Bosnia, the world changes. The roads are not so good and the drivers are even worse. This is Volkswagen Polo country. No MOT’s – nothing. We arrive in Mostar (named after its old bridge) for another break. On November 9, 1993, HVO troops destroyed the city’s most recognisable landmark, an Ottoman-era bridge built in 1566, which is the city’s namesake. Today, the city is slowly recovering from divisions created by the conflict. Some of the scars of that division still remain today. There are many graveyards in the town and many buildings are still badly damaged as a result of the war. The famous bridge has been rebuilt thankfully. There is snow on the surrounding mountains and old women sell oranges by the roadside. Still we head south. Two hours from Sarajevo and the roads are deteriorating and it is raining heavily. This is a very humbling place. There are shell and bullet marks on the buildings and the destruction is very visible. We arrive in Sarajevo late afternoon and drive down Sniper Alley past Tito’s large TV station and the Holiday Inn. The story goes that during the war there were only two rates for rooms. Cheapest facing the snipers in the mountains, more expensive facing away from the mountains. ‘Sniper Alley’ is the informal name for the main boulevard in Sarajevo which, during the Bosnian War, was lined with snipers’ posts, and became infamous as a dangerous place for civilians to traverse. The road was home to the only source of clean water in the city and connects the industrial part of the city to the Old Town’s cultural and historic sites. The boulevard itself has many high-rise buildings, giving sniper shooters extensive fields of fire. Looking out our window where we stay is the large local hospital. Unfortunately, there is nothing in the building. There is no money to equip the hospital. The noise of cars blowing their horns is extremely loud. Eleven am and we finally get to meet the children at the Christine Willcutt Centre. Christine Willcutt was killed by a sniper in the first aid convoy when the fighting ended. The centre for the children is supported by international charities, but has severe difficulties sourcing funding. The children are in red tartan kilts and do a Highland dance. We do a 45-minute set for the children who are dancing away and going crazy. We gave the children gifts and also a donation to the centre from Stornoway businesses and individuals. They were very grateful. We make an appearance live on Bosnian television at six o’clock and Iain Macleod explains the mechanics of the bagpipes to the puzzled presenters. Catriona sings a Gaelic song. This must be the first time a Gaelic song has been sung live on Bosnian TV. A day off. We decide to explore. Get a taxi to the old town and are immediately accosted by young gypsy children begging. Catriona is nervous. This is not Byres Road. We visit the library building which was burnt by the Serbs in 1993. As the locals tried to save the books, they were shot from the mountains by snipers as they ran from the building. The library is boarded up and has not been repaired. There is much evidence of the war and many graveyards by the side of the roads.The day is spent exploring the centre of Sarajevo. This city is in bad shape. In the evening, all the men and women walk the streets dressed up in their best outfits. The streets are thronging with people just walking the street. There is no money for them to do anything else. But the people are friendly. We have Cevapi, beef sausage in pita bread. Cevapi are grilled and served in pita bread, previously dressed by gravy with chopped onion aside. Walk past the war memorial and the town hall. It represents the most beautiful and the most representative building from Austro-Hungarian period, built in pseudo-Moorish style. It’s late and we head for home. Get up at 2.30 am for a five hour drive north to Zagreb. It is raining heavily and the road is in bad shape. No lighting, cat’s eyes, white lines and it is difficult to see where you are going. Only one headlamp working does not help. There are more potholes than road, and the suspension is taking a hammering. Five of us and all our baggage in a small car. We are restless. At least Anja, our driver, knows where we are. Eventually at 5am we cross the border into Croatia and all of a sudden the road improves and we stop at a service station for a hearty breakfast. The sun comes up and all is well in the world. Catriona takes over the driving. Although the road is straight and wide, there is muttering in the back of the car. We arrive Zagreb 10am and board flight for Luton. Author dmorrisonPosted on April 23, 2010 Categories Fidhleirean Eilean an Fhraoich, Photos 2007, Student News, Taransay NewsTags 2007, Catriona Watt, Fidhleirean Eilean an FhraoichLeave a comment on Hebridean musicians entertain in the Balkans.